Raahil Djhruva reached out gently across the generational divide and helped a community member learn how to use Skype so he could communicate with his daughter. Dhruva, a junior at Queens University of Charlotte from London, England, called the experience “an emotional moment.” His was one story of many. Along with a team of students in the James L. Knight School of Communication, Dhruva volunteered to teach digital and media literacy skills to residents of Myers Park, the university’s neighborhood. Through a new partnership with Myers Park Home Owners Association, the school offered a digital and media literacy session entitled "My Digital Life: Social media meets personal privacy" on Oct. 12. The school’s Knight-Crane Convergence Laboratory was filled with curious residents, eager to learn and to share their questions and worries about the Digital Age. Dr. John A. McArthur, an assistant professor in the school, led a discussion about social media and privacy, providing the context of Marshall McLuhan’s predictions come true and citizens’ growing need to keep up with rapid change. 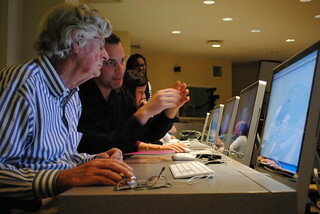 After the discussion, communication students and attendees met shoulder to shoulder at the computers. Freshman Knight Scholar Zenzele Barnes taught several neighbors how to use Twitter. Others, like communication major Mena Shenouda, worked with parents who wanted to learn about their children's use of Facebook. Senior communication students Amelia Farmer and Sara Beth Jones helped participants learn how to adjust Facebook's privacy settings. “Facebook today at 800 million users has the same number of people that used the entire Internet in 2004,” Dr. McArthur told the group. "Our role is to be a safe place for people in the community to be able to ask questions and gain knowledge," remarked Van King, dean of the school. The Knight School of Communication is focused on increasing digital and media literacy in Charlotte. Students at the school will be involved in the community, teaching skills that empower residents to contribute to their communities through digital media. Myers Park, the community closest to Queens, is just the beginning. To learn more, download the Knight School Master Plan.